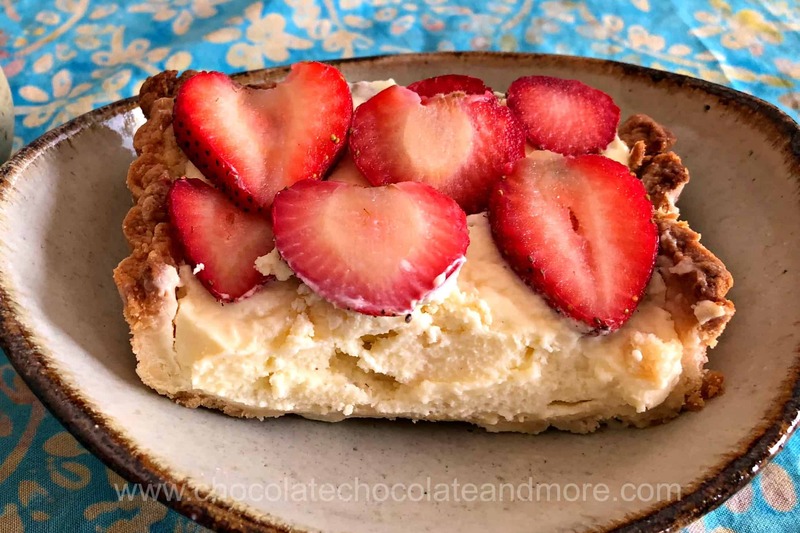 Strawberry Mascarpone Tart - Chocolate Chocolate and More! 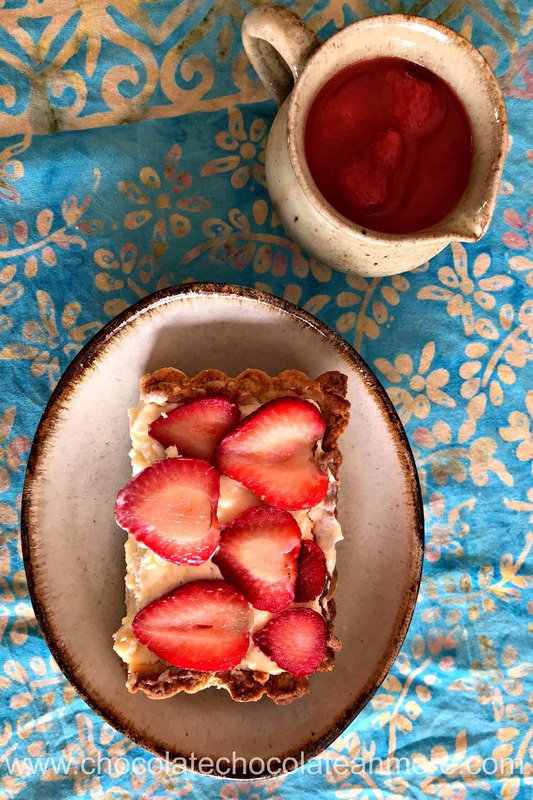 Fresh strawberries on top of dreamy vanilla mascarpone in a lemon crust – strawberry mascarpone tart is a perfect balance between sweet and tart. It’s perfect for a light dessert or tea time treat. Don’t have a tart pan, make this in a 9 x 13″ pan and cut into bars. Last week, I went to see the Avengers movie at the mall. There’s a large grocery store there so I always check to see if they have anything good on my way out. I found a half pint of fresh strawberries. Not old strawberries but really nice fresh ones. This is incredibly rare here in Cambodia and I really love fresh berries. So I grabbed them even though they were $6. A half pint really isn’t that much and I wanted to share. A few weeks ago I made an apricot mascarpone tart for a party so I thought I’d change that up. This strawberry mascarpone tart starts with the same lemon crust recipe. If you’re in a rush, you could use Pillsbury pie dough or make a graham cracker crust. I wanted the mascarpone to taste like whipped cream. Is there really anything better than strawberries and whipped cream? So I added just a little sugar and some vanilla to the mascarpone cheese. The result is truly amazing. I think I’ve accidentally discovered how to make a whipped cream substitute for recipes that need whipped cream that can stand up in the heat. In order to transport this to church, I filled the tart shell with the mascarpone and wrapped the whole thing in plastic wrap. Just before serving, one of the ladies at church helped me arrange tfresh sliced strawberries on top. I brought a little strawberry orange syrup to give it a little more flavor but that really wasn’t necessary. Oh. my. word. 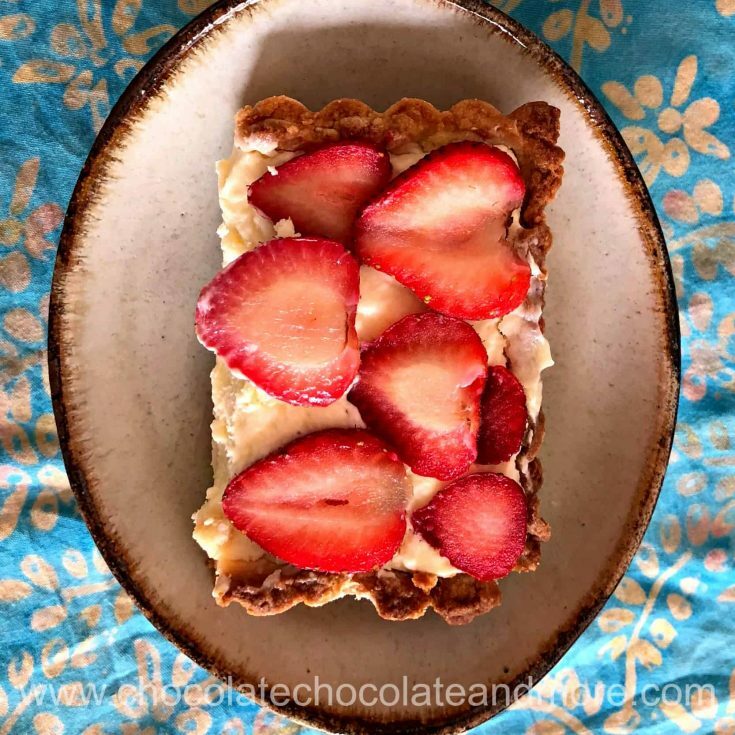 With or without the sauce this strawberry mascarpone tart is lick your plate clean good! It tastes like strawberries and whipped cream in a lightly flavored lemon cookie. And it’s so easy to make! The tart shell can be made ahead and frozen. The rest comes together in just a few minutes. Roll out to desired shape and line tart pan or press into the bottom of a 9 x 13" baking dish. Cover with parchment paper and fill with beans or pie weights. Bake at 350°F for 20 minutes. Remove the parchment paper and beans (or weights). Bake another 5 minutes until golden. Let cool completely. Mix mascarpone cheese, powdered sugar and vanilla until well combined. Spread the mascarpone filling in the tart shell (or over the crust in the baking dish). 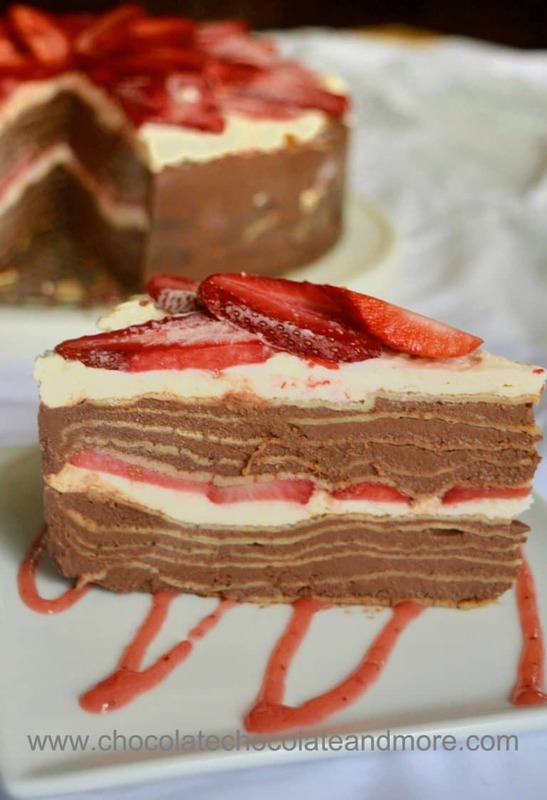 Top with fresh sliced strawberries. One of my favorite desserts is a simple strawberry pie with a layer of sweetened mascarpone cheese. 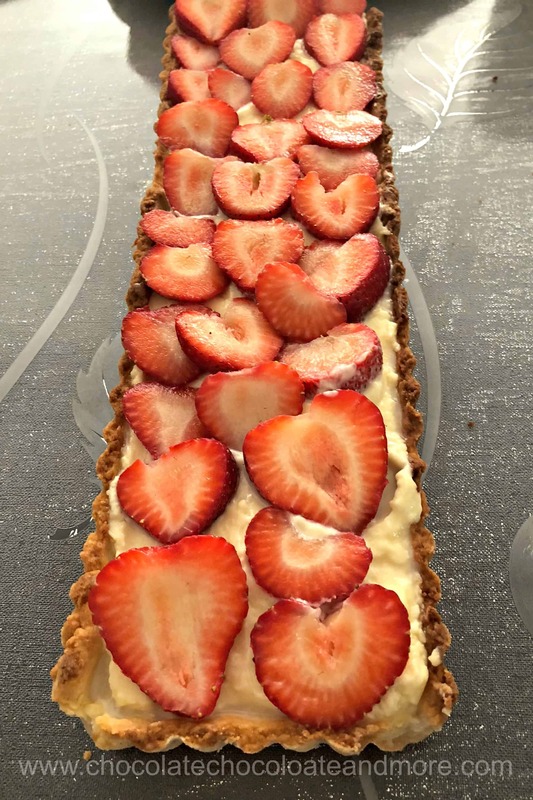 Your tart flips those ratios…more cheese and less strawberries and I know I would love it! Thanks for stopping by Barb. The mascarpone filling really makes this tart. You could top it with any berries you have around.